"Sway" was designed to give an island plantation feel to an ocean view home. The shape inspired by the tapered bend of a palm tree trunk captured the grounded yet relaxed feeling the tables needed. The asymmetrical curve of the table base is dynamic and suggests movement. The construction of "Sway" required techniques adapted from both traditional boatbuilding and modern laser technology. 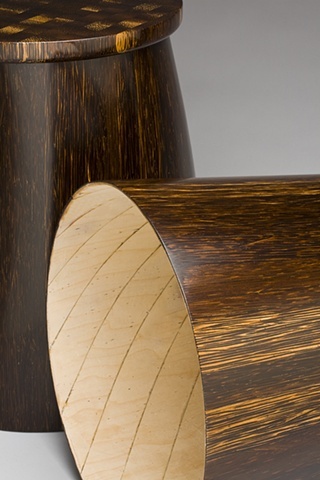 The tapered, curved barrel of the base was formed by placing laser cut bent laminations of airplane ply in a spiral pattern over a mold before the final vertical laminations of Black Palm were applied. The tops are Black Palm end grain butcher block so that the wood grain appears to run straight up through the entire piece, as if it were carved from a massive trunk.